Once a new can of foam has been attached to the dispensing gun, keep attached (up to 30 days) until you're finished and ready to switch to a different can of GREAT STUFF PRO™. When you're done for the day, completely close the gun's regulating valve and store your gun, with the can of foam attached, in a cool, dry place. Note: You can clean your gun when switching between cans. The acetone in GREAT STUFF PRO™ Gun Cleaner can adversely affect the curing of GREAT STUFF PRO™ foam, so keep it away from any foam that's curing. 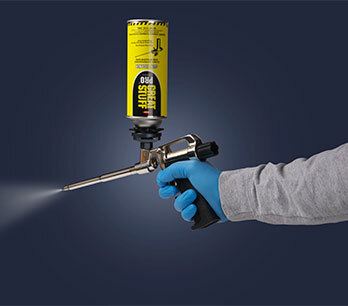 GREAT STUFF PRO™ Gun Cleaner comes with two attachments to help keep your gun, and any product cans, in good working order — a black gun adapter mechanism and a red spray nozzle. You don't need to attach the can of cleaner to the gun. Place (or keep) the attachment to the Gun Cleaner can. Spray the Gun Cleaner on the basket of the dispensing gun. Otherwise, foam from the removed can will cure and the gun will stick to the can. Attach the gun to the new can and spray the old foam into a waste receptacle until new foam comes out, showing uniform color and consistency. Make sure the black gun adapter mechanism is on top of the cleaner can. Attach your gun to it. Press the gun trigger to remove any residual foam from inside the gun. Apply the red spray nozzle. Spray the cleaner to remove any uncured foam outside the gun. Spray the cleaner on top of any GREAT STUFF PRO™ can to remove uncured foam.